We have been to Bali twice, and the first question I get from friends and readers is: is still worth to travel to Bali? My answer: Yes, but you need to know how to enjoy the best of Bali. The island of Gods has been the perfect summer travel destination for years and because of this many areas are too developed and too touristic. However, there are plenty of amazing things to do in Bali, places to see and experiences to have. Let’s get it straight, Bali is not only Kuta Beach or Uluwatu. There are other amazing beaches around, nice villages with lovely people and stunning nature. So if you are planning your trip to Indonesia follow our travel guide to the best of Bali and I’m sure you gonna fall in love with this island too! Bali is famous for the perfect waves, rice fields, volcanos, Hindu temples, yoga, meditation and delicious food. Off course, you want to enjoy all these attractions, but at the same time you wanna have a taste of local Bali, a more authentic and unique Balinese experience. I totally understand you, that’s why we decided to share our personal experiences and our favorite things to do in Bali. Where to stay In Bali? Where is the best place? Before choosing the best accommodation in Bali you need to think about the best area to stay in Bali. My tip is to choose the location based on the type of experience you want to have. Kuta Beach: touristy, too busy, too noisy, too many drunk people and groups of tourist. I’m not a big fan of this area but there you can find the big hotel chains, popular resorts and shopping malls. Denpasar: too busy. It’s the business center of the island, with heavy traffic and far from the beach. Legian Beach: it’s like Kuta, with less clubs and bars. Seminyak: the trendy side of Bali with top restaurants, fancy beach bars, boutique hotels and local designers. It’ busy but it’s good and has an interesting vibe. It’s booming now. Canggu: this is the hipster side of Bali. Lovely cafes and charming restaurants. Surf beach, quiet village and there are rice fields everywhere. There you can get a taste of local life. We lived there for two months and loved it!! Sanur: it’s nice, the beach is good, but I think it doesn’t have too much character. Ubud: is the hippie part of Bali. Yoga studios, raw food restaurants and meditation retreat. Ubud is zen! Uluwatu: favorite spot among surfers and those looking for stunning cliff views. Before listing places to visit and attractions, let’s talk about things to do in Bali, experiences that you can only have in the Island fo Gods. 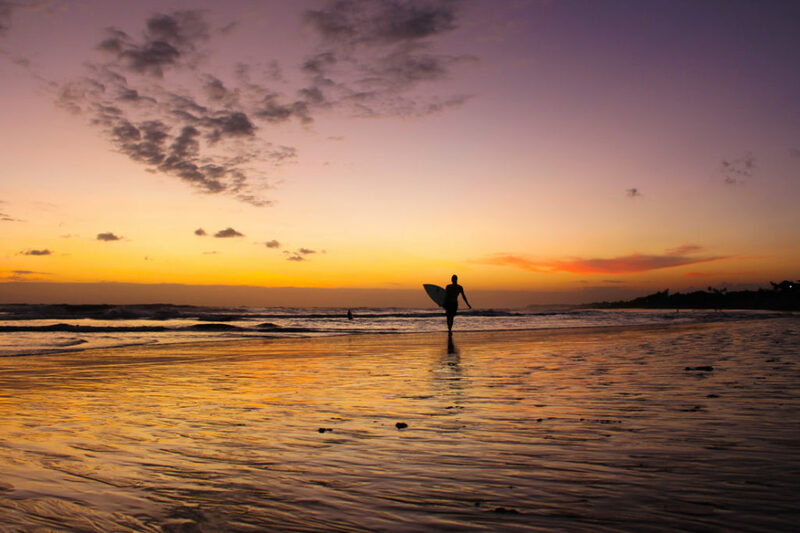 Bali is the perfect surf destination, and you must surf in Bali. Travel to Bali and not catching a wave is the same as going to Rome and don’t see the Pope. There is no excuse!! I have never surfed before and I had a blast! I got scared. I laughed. I caught a wave. I felt. I repeated it. I got exhausted. I surfed! One of the best places to learn how to surf in Bali is Kuta Beach [a bit overcrowded with people learning, what can be dangerous too]. Legian and Seminyak are good too. The less crowded options are Batu Bolong and Olds Man, both of them in Canggu, 40 min. driving from Kuta. One of the best experiences we had in Bali. No doubt, climbing the Mount Batur during nighttime is one of the best things to do in Bali, and you won’t regret it. Mount Batur is on the north part of the Island, you can choose a tour that will take you all the way there and also guide you through the climbing, or you can drive to the little village on the foot of the volcano and hire a guide there. The trekking starts at 3 – 3:30AM, the climbing to the last summit of Mt. Batur takes about 2:30 hours [the craters is 1,717 above sea level]. You need to hurry up, otherwise you gonna miss the incredible sunrise above the clouds! The way up is hard, I’m gonna be honest with you, specially the last part between the two summits [we are used to run and trek but in certain parts my legs were tired]. But don’t give up, use all your energy to climb, it’s worth it! If you think you gonna take more than 3 hours to trek the volcano, talk to the tour operator to start your ascent earlier. When you arrive on the top of Mt. 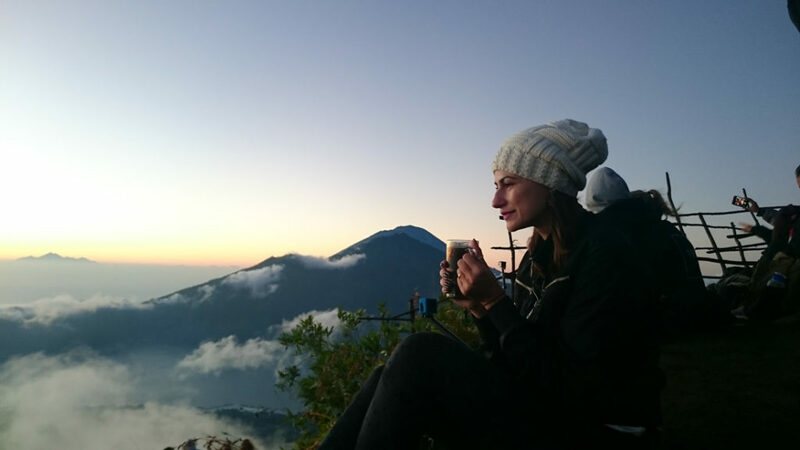 Batur you will be rewarded with an orange sunrise, hot coffee, a simple breakfast and off course one of the best views of Bali! If the photos weren’t enough to convince you, watch our video climbing Mt. Batur and see how gorgeous that place is. One of the unique things to do in Bali is to visit Ubud and connect with your spirituality. You can do that in many ways: meditation classes, yoga classes, spa sessions, trekking the Campuhan Ridge Walk, visiting temples or relaxing in a hotel. Most of the people go to Ubud to visit the Art Market, the Ubud Royal Palace Puri Saren Agung and the Ubud Monkey Forest. Of course, you must visit them all, but the most important thing to do in Ubud is to stay zen! 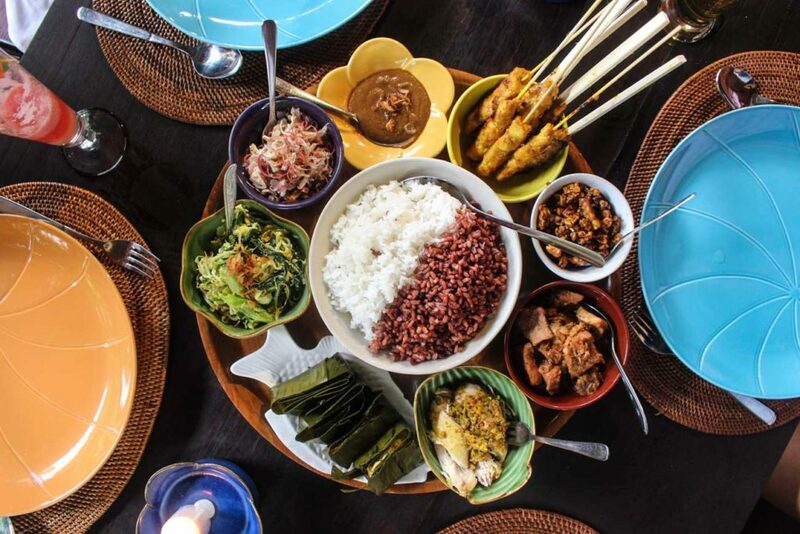 Balinese food is delicious, a mix of flavors and fresh ingredients. Paradise for meat lovers, vegetarians and vegans. Eating is one of the top things to do in Bali. Doesn’t matter what you like or dislike, there is always a restaurant, a small bistrô or a family Warung ready to satisfy your cravings for delicious and healthy food. Fish and seafood are always fresh in Bali! If you are vegetarian then you must try the local tempe with peanut sauce. Carnivorous can go for beef rendang and chicken satay, they are the best sellers. And don’t forget to try the traditional Nasi Campur, our favorites is at The Piring Daun Restaurant. Juices made with vegetable and spices like ginger and turmeric, are a big thing in Bali and breakfast are serious business. You gonna find mouthwatering menu serving from eggs ‘n’ bacon, to smoothie fruit bowls that taste like heaven. One of the unique things to do in Bali is to attend a cooking class, but not a normal one. To experience the best of Bali go on Rumah Desa tour. Learn how to craft the traditional baskets used for offers, how to prepare Balinese food and spices, the coconut oil process and how to plant rice. It’s a hands-on experience, an awesome way to get close to the real life in Bali and meet locals. I had an amazing time learning about the ingredients, chopping and slicing vegetables, helping to prepare our delicious meal. While Rob was having fun in the fields, planting rice and even riding a cow. Bali is a huge island and to see the best of it you need to move. 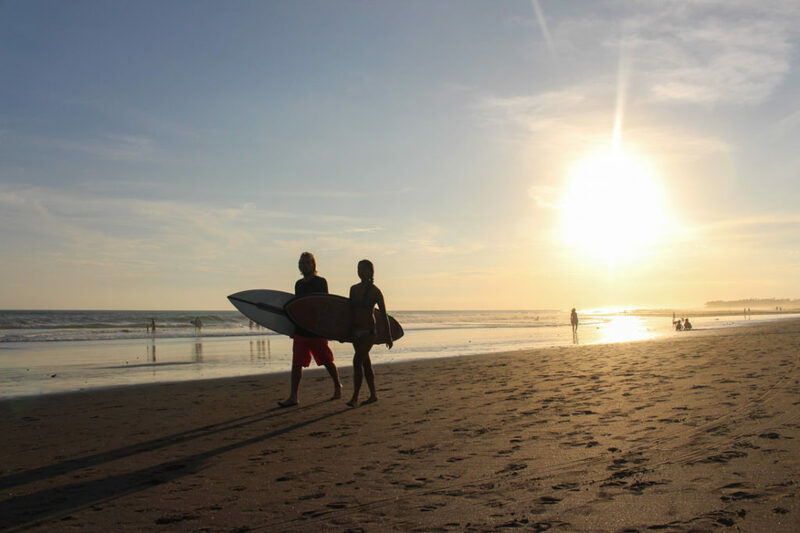 Kuta, Legian and Seminyak are the traditional busy beaches. Sanur is another famous beach, specially for those who want calm sea and a relaxing time. The beaches close to Uluwatu are perfect for surfers, and most of them are hidden at the end of long and curvy roads. One of the best things to do in Bali is to rent a motorbike [or a scooter] and go beach hopping. One day you can explore the southwest coast, from Kuta Beach go west, passing by Canggu and arriving in Tanah Lot. Next day head northeast, passing by Sanur, Keramas and White Sand Beach. 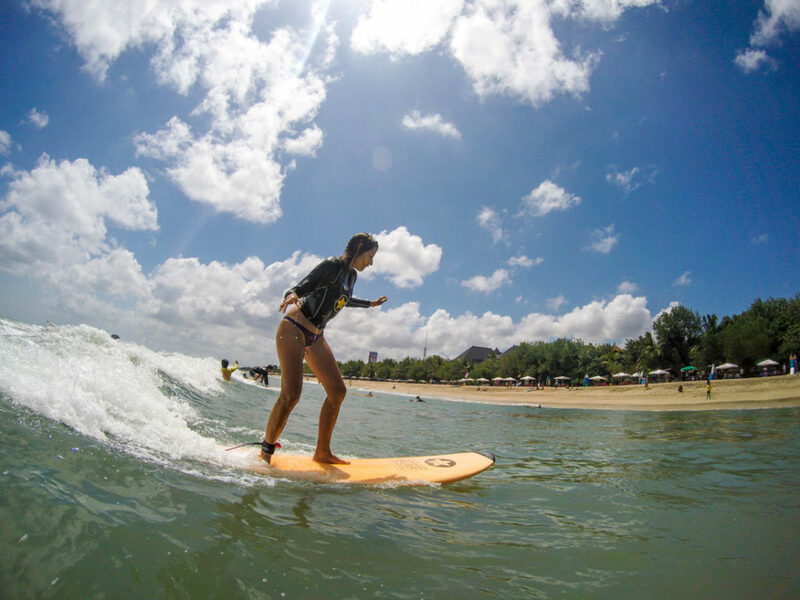 On the other day go further south and explore all the beach on the way from Kuta to Uluwatu. Be prepared to drive up and down hill, get stuck in crazy traffic jams, and also to see incredible beaches and talented surfers. The Lawn at Olds Man Beach, Canggu – The rice fields around Canggu area. We are done with experiences, unique things to do in Bali, moments that you can only have in this incredible island. Now it’s time to talk about the unmissable tourist attractions in Bali. Some of them despite being fantastic, are very touristy, but you can’t leave the islands of Gods without visiting them. Bali is called the island of Gods and it’s easy to understand way. In every corner you will find a temple and offers to many Gods. The Hinduism is not only a religion there, also the way of living and how the Balinese society is organized. 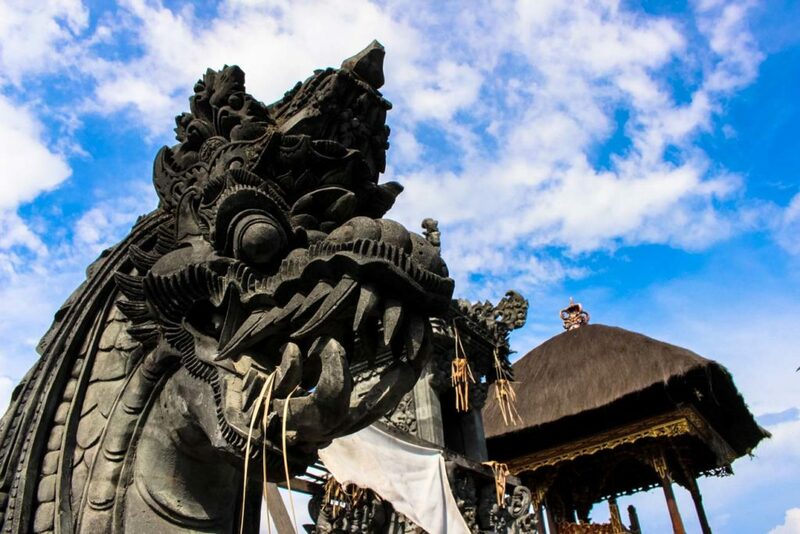 The Balinese architecture in the temples is stunning, with delicate wooden carving, huge sculptures and flowers ornaments. No doubt the top attractions in Bali are the temples, and here is a list of the ones you must visit. You can’t leave Bali without going to Uluwatu, go watch the sunset and the Kecak dance performance. The fire dance happens daily from 6:30PM and has the sunset as the background. 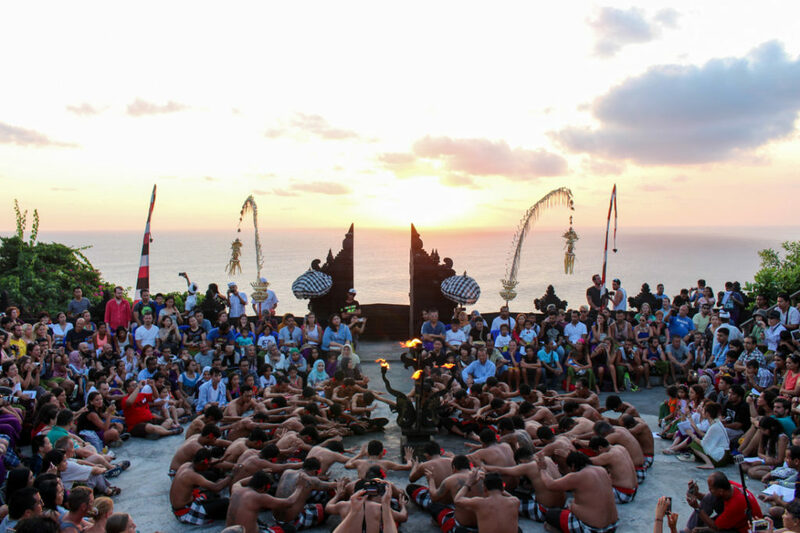 The entrance fee to Uluwatu is 30,000IDR and the Kecak Dance ticket 100,000IDR. Arrive before 6PM and get the best seats, also be aware of the monkeys around the temple, they love to steal phones, cameras, sunglasses, bottle of water and anything that is shiny. Located in Bali central highlands, the temple is one of the most visited places in the island. The architecture and the lake Beratan are majestic. It’s not an easy place to go, you will need to book a tour to Ulun Danu Bratan Temple, or you can venture yourself going there by scooter. My favorite temple in Bali, love to see the people doing the water purification ritual, the kids being blessed and the possibility to be part of it. Even being one of the top tourist attractions in Bali, it is so organized and welcoming that you feel good to be there. The temple is open from 9AM to 7PM, go early in the morning or late in the afternoon to avoid the big groups of tourist. Entrance fee: 15,000IDR and includes the sarong to get in the temple. This is one of the most known temple in Bali, it’s right on the shore of the beach, with waves breaking on the rocks and the sun setting in the background. This s biggest and the most important temple in Bali. 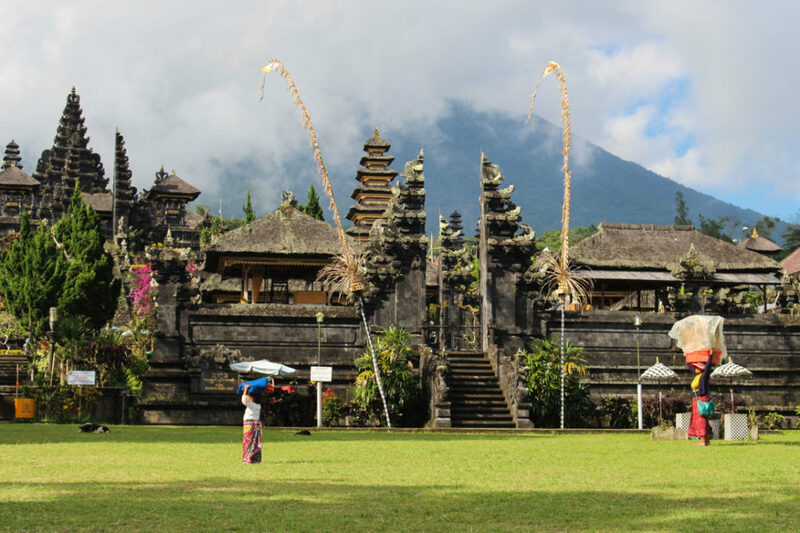 It sits at the foot of Mount Agung, the highest mountain in the island, and it’s a complex of different temples and shrines located 1000 meters above sea level. The Temple is stunning but is so hard to pass by all these annoying tourist traps that by the end you just want to leave the place instead of visiting it. 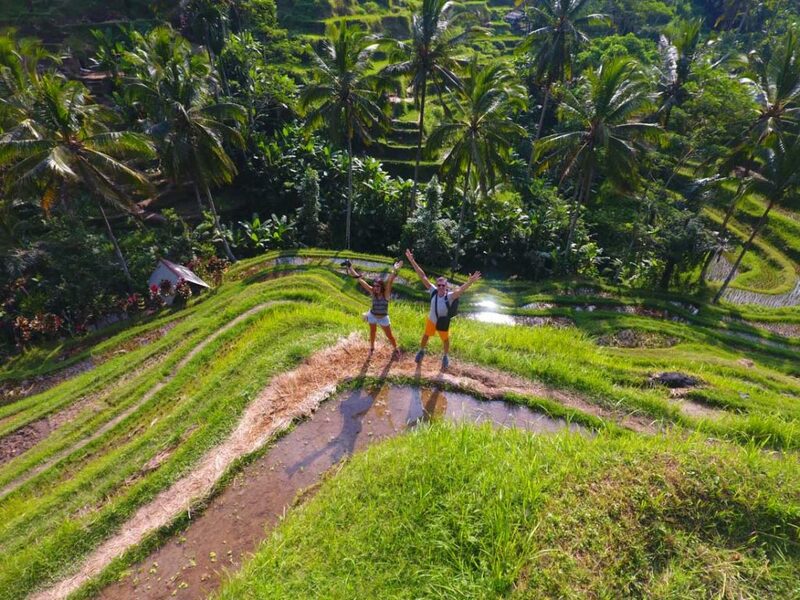 The rice paddies are part of Bali culture and way of living. In Kuta Beach and other developed areas they don’t exist anymore, but if you venture yourself a little further into Bali’s countryside you can enjoy the endless fields with all shades of green. Those are the best places to stay in Bali, choose the one suits your style of traveling and book a hotel. There is an infinity option of hotels, resorts and guesthouses in Bali, from a couple of dollars to hundreds of bucks per night. The best websites to search and book a hotel in Bali are Agoda and Booking.com, we use them and recommend. How to get to Bali and how to get around? Bali has a busy international airport, to find the best flights, prices and connections use Skyscanner. You can compare the prices during the whole month and choose the cheapest dates to fly. 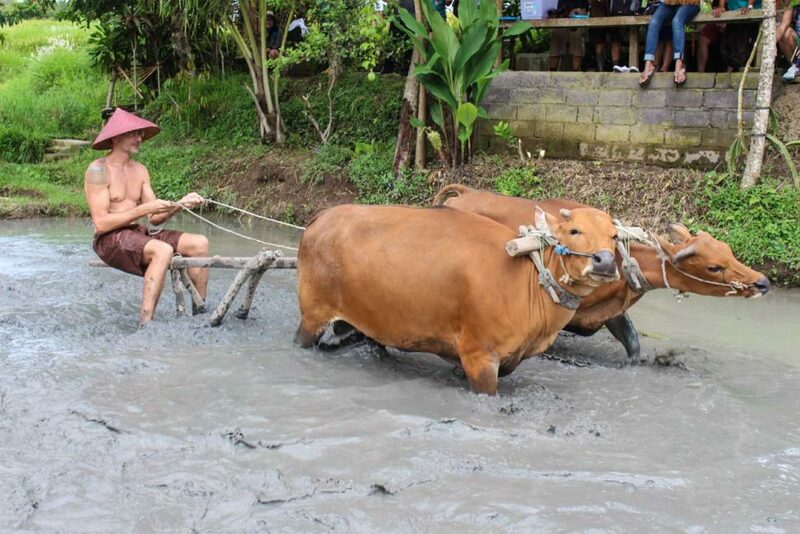 To get around Bali is a bit trick. Traffic is heavy, and if you rely on taxis you gonna spend precious time stuck in traffic jams. The best option is to rent a scooter and explore the island on your pace. You can rent a motorbike in any tourist agent near your hotel, it’s super easy. But be careful, some roads are in bad condition, tourists drive like crazy, and some traffic rules just don’t exist there. Always wear a helmet and don’t forget your travel insurance. We use World Nomads, every time we need we were covered. This is just a small picture of all the great things to do in Bali, we didn’t explore the north and west part of the island yet, so we definitely go back for more. And once we discover new places and local experience we gonna share with you. Hope you liked our personal travel guide to Bali. Follow our tips and recommendations for the best things to do in Bali and be sure you gonna have an amazing time. The Island of Gods is waiting for you, go and enjoy it! PS: This trip was partially organized by the Indonesian Ministry of Tourism. As usual, doesn’t matter who pays the bill, you receive my honest opinion and impression. Love it! And love your pictures but the best is Rob plowing the field with the ox 😉 That cracked me up. If travel blogging doesn’t work out , I think he has a career waiting! Bali is one of the best Indonesian tourist hot spot you really want to go, so many things to do and so many places to visit and marvel! That’s true Rosemarie, Bali is a marvelous island! I’m leaving for Indonesia tomorrow and it’s fair to say I’m SOOOO excited. I’ve just booked a tour to climb Mt Batur. Looks so amazing. Thanks for the tips! Will head to that secret beach too if I have time! OMG!! I’m sure you gonna love Indonesia, Bali and to climb on Mt Batur!! It’s awesome!!! Can I go with you?? I’m already missing this beautiful part of the world. Great article and photos! I’m going there in a couple weeks, so this is very helpful. Thank you! Enjoy Bali, it’s a beautiful island. I’m glad to share useful tips with you!! Great guide! Those beaches look lovely but I would love to climb the volcano and watch the sunset from there! Bali is so high on my list. I will have to hold on to this because I hope to go next year. I’m sure you gonna love Bali, it’s a unique and big island, with tons of fun and interesting thing to do! If you need any further tips let me know. what a great comprehensive guide to Bali. So many people write about Bali, but they mostly focus on the obvious, touristy parts of the island. Such diversity and range of activities to do. I would definitely love to learn how to surf in Bali! Surf is Bali is a big challenge, at least for myself, but it was a great experience. The beauty and power of the sea are incredible, while surfing you feel connected with nature! I would love to visit Bali someday! Specifically, I’d love to watch a sunrise from the top of a volcano and visit the secret rice paddies. 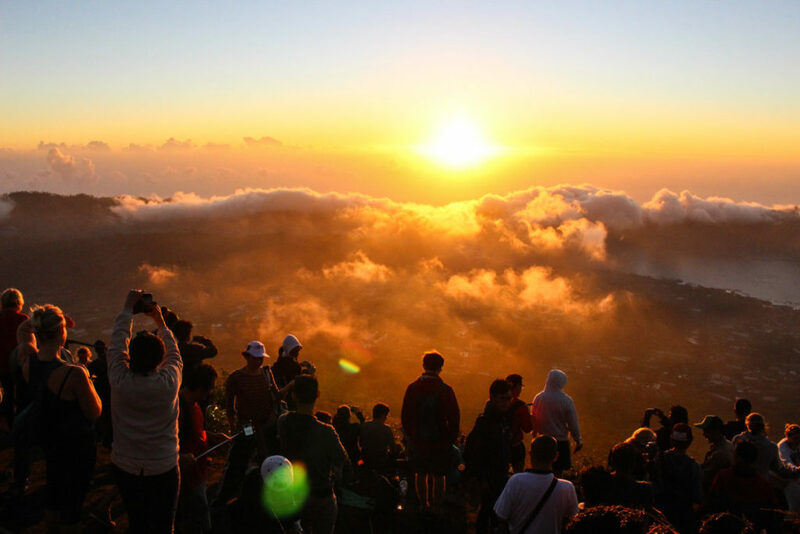 Tara, the sunrise from the volcano is unbelievably beautiful… I’m sure you would love it! It was one of the best moments of my Bali experience! Climbing Mt. Batur and being zen in Ubud sound amazing! Musts for sure. I’d love riding around on my own scooter to explore. It looks like a great way to soak up the Bali vibe. Riding a scooter around the island is definitely the best way to find hidden gems and to get into the beach surf Bali mood! The road between M.t Batur and Ubud is incredible, if you fancy a long drive this might be perfect for you! I haven’t been to Bali since 2011 but it looks like not much has changed. Still beautiful with amazing sunsets. The Kecak dance at Uluwatu temple brings back great memories. The island may haven’t changed a lot since 2011, but I’m sure the amount of people in Kuta Beach and Uluwatu increased a lot. Even though, it still an amazing place to visit! I don’t know if I’d be keen to rent a scooter. I haven’t been to Indonesia, but everywhere else I’ve been in Asia is insane with the traffic. The traffic in Bali is not so bad as in Vietnam or Bangkok. If you avoid Denpasar area you should be fine. A good thing is that in Bali people drive slowly and the roads are so scenic that you enjoy the ride! If you have the chance go for it!! Bali is incredible, a place everybody must visit al least once in a lifetime. Bali is high on our list and I have pinned your post as well. Lots of great information to explore Bali in different ways. The sunset looks amazing and I am looking forward to taking fascinatig pictures of the rice fields too. I’m sure you gonna love Bali!! It’s a special place, especially with go out of the tourist area and explore the real Bali! I’m sure you can Surf in Bali. I had so much fun, and now I’m looking forward to do it again! We have been there 4 times or 5 times or I lose track LOL, and love it more each time. So much to see and do. I always tell folks the Bukit region – Pandawa Beach, Ganung Payung (for beauty not swimming) is the best beach area and 20 minutes outside of Ubud in the ricefields is the best overall area of Bali, to see old skool Balinese living when people in villages like Kelabang Moding, Lodtunduh and Keroutan are getting up and about in the morning, and having ceremonies in the evening. We lived in each village for a month. First class experience. See Bali how the Balinese do. Thanks for the awesome round up Natalie! Thanks for your tips, Bukit region is very beautiful!! I wish I had visited Tanah Lot. I regret it so much. Bali is amazing, we miss the vibe and food!! If you want to be in the middle of nature so Ubud is a great choice. Or if you want a quiet beach go to Canggu. We loved Gili islands, we stayed only 3 nights but I would stay longer. Usually the hotel or tour agency will offer you the transfer from Ubud to the pier to catch the boat to Gili. Jimbaran has a longer stretch of sand and is close to Kuta, Uluwatu is stunning for the views. Thank you for all the tips! My husband and I are going in September and will be staying in Ubud and Canguu thanks to your article! We can’t wait! How was your experiencing with renting a scooter? What is the process to getting a license? Renting a motorbike in Bali is straight forward. Some companies will ask your passport as a warranty others don’t. I would recommend getting an international drivers license at your home country. Rental companies might not ask but the police will. Thanks for sharing this great post and the photos were also amazing. Enjoyed checking it. Thanks again. Hi! Thank you for the nice overview! Can you tell me what is the name of the place where you have taken the pool photo, seems somewhere in Ubud. The view from the pool to the ricefield looks amazing! It is a hotel in Canggu called Kampung Canggu.